Click the diagram above for a larger view. Printhead – applies ink to paper. Stepper motor – controls the movement of the belt that moves the printhead. Stabilizer bar – keeps the printhead and motor evenly lined up. Interface ribbon – carries information to the printhead about the task at hand. 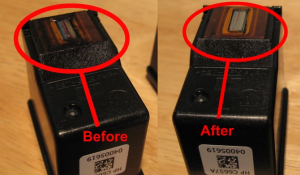 An ink cartridge before and after step #2. Take the cartridges out of the machine, turn it off, and unplug it. Fold a paper towel in fourths, dampen it with isopropyl alcohol and wipe the part of the cartridge that releases the printer ink. 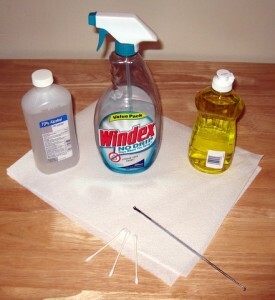 Fold another paper towel in fourths and dampen with glass cleaner. Carefully wipe the ribbon, which should be located right behind the printhead. 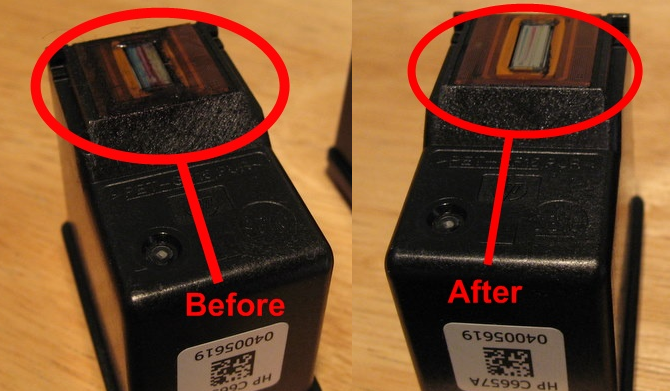 Because the ink cartridges dock on one side of the machine when not printing, a mess can form beneath them. This can be difficult to reach, so use your long hook or pencil to scrape the ink residue from the floor of the printer. When the stabilizer bar is dirty, you may hear grinding noises when the printhead is moving. Pour a few drops of oil on the bar and manually move the printhead back and forth to evenly spread and coat the oil. Because the feed rollers can be tough to reach, use cotton swabs damp with isopropyl alcohol to wipe excess dirt or ink off the rollers. 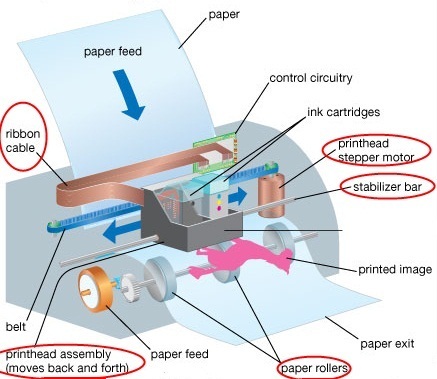 For more in-depth detail, see Cleaning Printer Rollers. Once the inside has been cleaned, use your paper towel and glass cleaner to wipe down the outside of the machine. There is always a risk that comes along with performing tasks like this yourself, so proceed with caution. Even though inkjet printers are not overly expensive, you still want to get as much life out of them as possible. By cleaning your machine using these steps, you can hopefully improve the quality of documents and prolong the life of the printer. 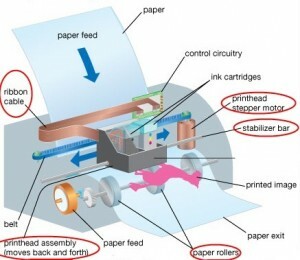 « What is a Printer Fuser?